As part of the certification process for becoming a middle school teacher of social studies, many states require candidates to first take and successfully pass the Praxis II Middle School: Social Studies exam. This exam will measure your understanding of United States history, world history, government and civics, geography, and economics. What Will I Be Expected to Know for the Test? This section covers United States history spanning from the precolonial period through to the cold war and early 21st century. You will be expected to understand not only the broader trends and events but the variety of experiences and events relevant to European, African, and indigenous people in North America. The world history section covers a broad range of major, global trends as well as significant regional developments spanning millennia. You will see questions on history from 8000 BCE through to today. This section also measures your understanding of the influence of religion, ideologies, innovations, and economic exchange in these major global historical trends. The Government and Civics section will measure your understanding of the key concepts and ideas on which the American government is based. You will need to know how the constitution was developed a well as its ongoing impact on government and politics. You’ll also need to understand the theory of separation of powers as well as what each of the three branches of government does. Beyond that, you need to understand the impact of this government structure on civil society including the rights and responsibilities of citizens and the relationship between politics and economics. The geography section measures a candidate’s understanding of the essential principles and methods of geography as well as the implications geography has in human societies. So you will need to be just as adept at understanding different types of maps, spatial patterns, and geologic processes that influence the formation of geographic features as you are at understanding how those geographic features influence human population patterns, migration, trade, politics, and the diffusion of ideas. This section covers the core concepts of both macro- and microeconomics. So you’ll be tested on essential ideas like scarcity, supply and demand, unemployment, Gross Domestic Product (GDP), currency circulation, and inflation. But you’ll also need to understand broader theories of economic including different types of market structures and economies as well as major global economic processes and characteristics. Finally, you need to understand the role that economics plays in societies and in individual human lives. How accurately your response addresses all parts of the question. The completeness of your response in dealing with each and every component of the question thoroughly and effectively. How focused and well organized your response is and your ability to avoid going off on tangents or providing unnecessary details. The thoroughness and detail of your response as well as your use of relevant and effective examples or supporting evidence when appropriate. How well you articulated your response in the written word while adhering to English grammar and conventions. 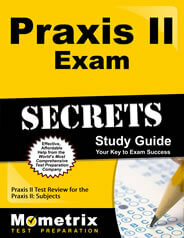 While the Praxis II Middle School: Social Studies exam is accepted in most states, the minimum score needed to pass is not the same across all of them. If you aren’t sure where you want to teach or you have a few states in mind, the best approach is to choose the highest minimum score required of the states as your target score. That way, no matter where you end up, you know you have a high enough score for certification. What’s the Best Way to Study for this Test? A significant amount of this exam deals with history, meaning you’ll need to memorize a lot of names, dates, places, and events. 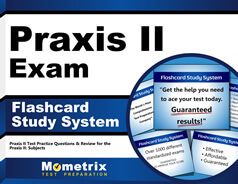 The best way to absorb all of that as quickly as possible is with Mometrix Flashcards. These expertly crafted cards already include all the essential info you need to know so that you can skip straight to the process of learning and absorbing. Use this along with the Mometrix Study Guide for a complete review of all the subjects you will be tested on!